Lake Santa Margarita is a gorgeous park and lake located in the San Luis Obispo region of the Central Coast of California. If you are looking for some outdoor fun on the Central Coast this is the place to visit. You can spend a day or camp which ever suites your fancy. 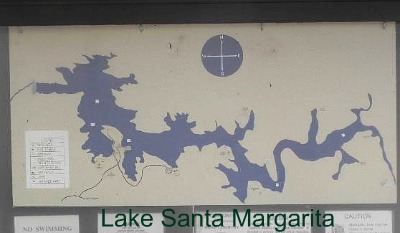 The Lake is Located just out side of the little community of Santa Margarita. The beautiful lake is hard to find, at least is was for us. The signs were hard to see and we spent about an hour trying to figure out how to get to the lake. The map below will help but keep your eyes peeled for the signs when going through the town of Santa Margarita. It was a fall day when we took a drive over the hill to the lake Santa Margarita. 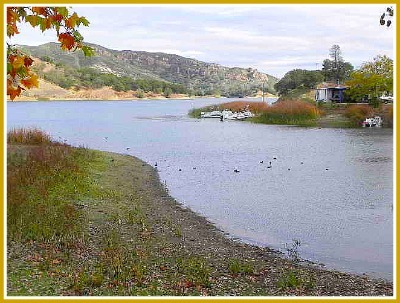 We had never been to Santa Margarita Lake and we were looking forward to seeing the sights. The day we visited there were only a couple of people around the lake. I ask the park attendant what it was like in the heat of summer and she just smile and said, "this place is packed." In this area of California the temperature gets into triple digits on a regular basis in the summer. I know, without a doubt, the lake is packed during the summer months. If you are into skiing Lake Santa Margarita is not for you. The lake does not allow water skiers or jet skiers. The lake supplies drinking water for San Luis Obispo and body contact is strictly forbidden. I don't think I have ever been to a lake were skiing and swimming was not allowed. It seems weird to even allow fishing in a drinking water reservoir. The lake is really narrow in most places and if skiers were allowed it could be very dangerous. If you like fresh water fishing this lake is great place to wet a hook. The lake is fully stocked with Largemouth Bass, Smallmouth Bass, Crappie, Rainbow Trout and many more species of fish. 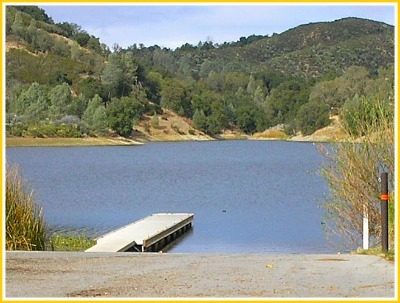 The Lake provides camping areas for RV's and tents. You have to make reservation well in advance to secure your camping spot. 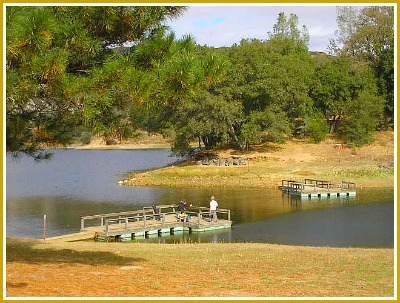 For information on camping at Lake Santa Margarita Click Here. The Lake Looks like a Dragon! The lake is 7 miles long. It doesn't look like a very big lake but it has 22 miles of shoreline and takes up 1100 surface acres. The map above makes the lake look like a giant dragon. We definitely recommend a visit to the lake when you visit the Central Coast of California. It is not that far from San Luis, Cambria or any other town on the coast. It would be a great place to take the kids, picnic or rent a Kayak.